Optical technology provides pinpoint accuracy on almost any surface. USB mini transceiver is compatible with most computers and has built-in storage for portability. Wireless design helps reduce cable clutter. Scroll wheel provides easy navigation for long documents and webpages. Ambidextrous design for comfort—use whether you are left-handed or right-handed. Includes 1 AA alkaline battery. dimensions 1.5" x 2.3" x 3.9"
The Wireless Mobile Mouse 1850 is designed for life on the go, offering wireless freedom and built-in transceiver storage for ultimate mobility. 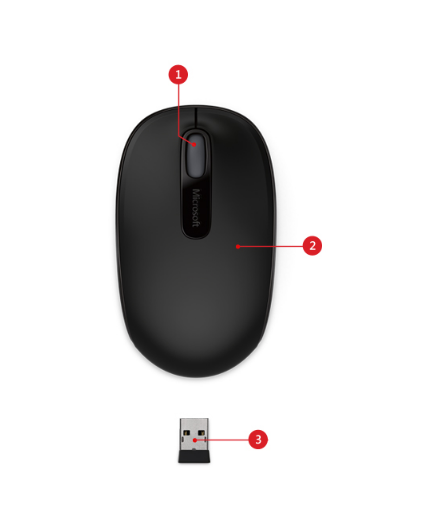 Comfortable to use with either hand and a scroll wheel for easy navigation makes this mouse the ideal device for your modern, mobile lifestyle.